Welcome to my famous songbook! Included in these pages are an enormous number of songs that I have collected during my years in Guiding. I have grouped the songs into categories which I hope you will find useful for helping to plan your own campfires. You are welcome to download my songbook pages for use in your units; however, many of these songs are already published in numerous Guiding song books or elsewhere. I have not included musical notation for any of the songs, nor do I intend to. This site is intended as a repository for song lyrics and to act as a memory 'trigger' for when you can't quite remember the words to your favourite songs. Please note! I do not take credit for writing any of the songs listed here! I have tried to indicate a print source for the songs wherever possible. 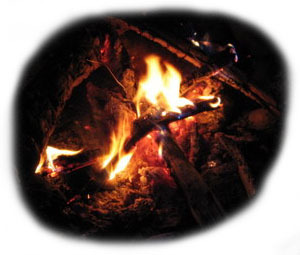 It is very difficult to track the origins of many of the songs traditionally sung around the campfire, since the whole art of the campfire is an oral tradition. If you feel I have infringed copyright by printing a song on this site, please let me know. Or, if you have a print source for a song that I don't have listed, please let me know that too! I get a lot of emails with questions about my songbook, and I am notoriously slow at responding. So to save yourself some time, you might want to check out my Frequently Asked Questions page before sending me an email. Hopefully this will save both of us some time. So now that all the formalities are done, sit back, get comfortable, and click on any of the links on the left of your screen to start exploring!